darktable 2.4.3 (for Windows) appears to fail reading Panasonic LUMIX DC-G9 high-resolution RW2 raw files. The error message emitted by darktable is "failed to read camera white balance". If one was to trust the documentation, then SIM "should be" a totally plain normal RW2 file: "Saves the first picture of pictures taken before the combining process ... [is started]"
Whatever hides inside HR - I have no idea. Theoretically this is the combined result of a total of eight pixel-shifted exposures. FWIW, RawTherapee 5.4 willingly opens both RW2, but reads /renders total garbage for both files. Is there a sample on RPU? I just (thought that I) uploaded two files (32 MB, 125 MB) onto RPU - I got "thanks", but I do not see these files in the repo list? FWIW, SILKYPIX Developer Studio 4.4 SE (Version: 4.4.14.5) - for Panasonic cameras only, runs on Windows and OSX - is able to open these raw files and render them. Don't slaughter me for mentioning that https://www.isl.co.jp/SILKYPIX/english/p/support/download/ has a download available and that installation on Windows is painless, not needing anything like a serial number or what-not. But that download is limited to processing files produced by Panasonic cameras. I got "thanks", but I do not see these files in the repo list? Thanks for submitting those samples, but they are really unhelpful. Please contribute something better/more recognizable, like daylight landscape. but interestingly the width is no longer a multiple of 14, which breaks all later assumptions. 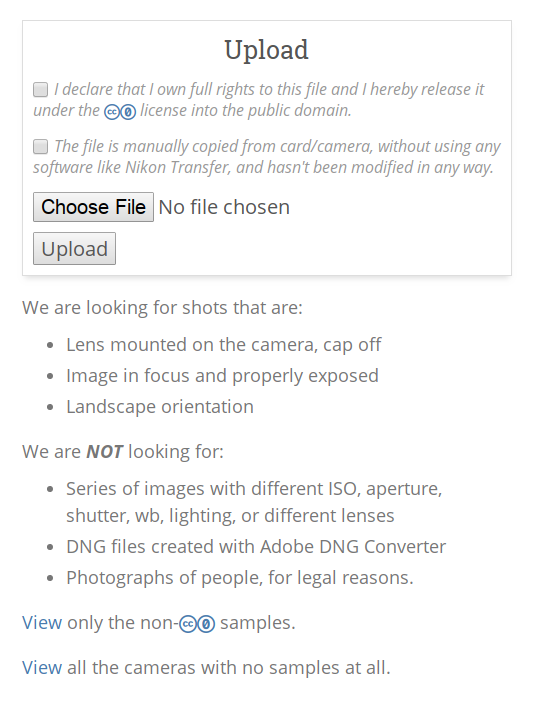 May I suggest that https://raw.pixls.us/ gets some language which indicates preferences general preferences? Right now the web site makes it appear as if anything is good enough. Perhaps mention: "Ideally a correctly exposed photo, taken in daylight, of a landscape"? FWIW, Adobe DNG Converter 10.1 is able to read both files and transform them into DNGs of size 13 MB and 48 MB, respectively. Note how the files shrank quite considerably from RW2 -> DNG (32 -> 13 MB; 125 -> 48 MB), while declared resolution remains at 5184x3888 and 10368x7776 respectively. Ah ... and now this gets rather fancy: darktable reads the DNG files produced by Adobe DNG Converter 10.1 - and, according to darktable (image information width/height), the resolution of these DNG files is 5280x3904 and 10480x7794. I have reconfirmed that exiftool shows 5184x3888 and 10368x7776 for both RW2 and DNG. I just discovered that FastRawViewer 1.4.6 (https://www.fastrawviewer.com/blog/FastRawViewer-1-4-6-release) has added support for the Panasonic G9 in high-res mode. Perhaps @LibRaw might be able to chime in? disable rawspeed for new panasonic decoder"
The problem was: I've looked into 0.19-tarball dcraw/dcraw.c which is original Dave Coffin's code. The commit in the libraw repo takes care of this, by way of (also) supporting the 14 bit resolution of the GH5s for format version 5. There is also interesting information in LibRaw/LibRaw@20efe0c where compression information is read (but, later, this is not used, it would seem). Reading around, it would seem as if Panasonic is switching to a new raw format for the newer cameras. and some even introduce artifacts. Adds support for newest Panasonic raw compression algorighm, v5. Currently used on GH5s camera, and on high-res raws from G9 samples. This does not actually handle the camera support part, that is TODO. The ppm dump matches that of the DNG's produced by ADC from these raws. Except the high-res raw, where there is some one-byte differences. Initial porting of this code from LibRaw, raw camera samples. Initial implementation of the algo in LibRaw. Bump Rw2Decoder version now that PanasonicDecompressorV5 is good. PanasonicDecompressorV5: rewrite actual pixel decoding with BitPumpLSB. PanasonicDecompressorV5: unswitch the innermost bps-based if. PanasonicDecompressorV5: rewrite with more explicit block usage. PanasonicDecompressorV5: rewrite block handling logic. PanasonicDecompressorV5: get rid of threading. PanasonicDecompressorV5: drop nop bad pixel handling. Panasonic DC-GH5S camera support. Uses V5 decompressor.